So while I struggle on with writing my own book, here’s a woman whose books I admire hugely! 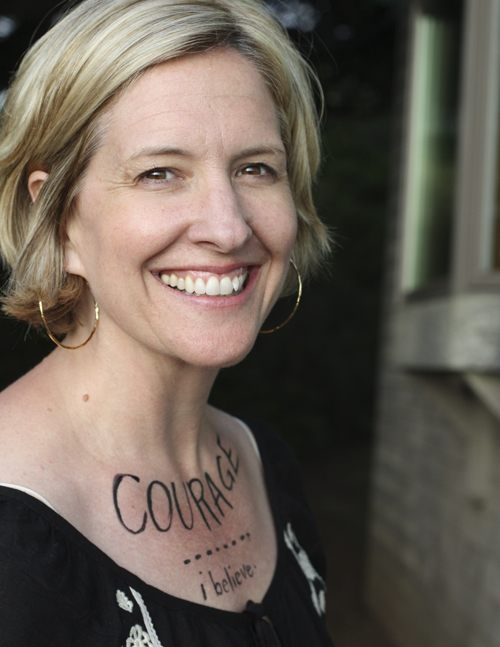 Brené Brown is a researcher-storyteller who has spent the past ten years studying vulnerability, courage, authenticity and shame. It was the publication of her latest book, The Gifts of Imperfection, and the Perfect Protest on her blog, that inspired my recent post about my *ahem* glorious imperfection. She’s inspiring, intelligent, real and doing such important work, and I’m thrilled to have her company in this space today! SC: Did you always know you’d teach and write? How did this path begin for you? BB: The journey that led me to become a researcher was anything but a straight and narrow path, which, ironically, is probably why and how I ended up studying human behavior and emotion for a living. I was a college drop-in and drop-out for a number of years. During my “off semesters,” I waited tables and tended bar, hitchhiked through Europe, partied too much, and played a lot of tennis. I found the social work profession in my late twenties and knew it was home. I did a two-year stint in junior colleges to raise my GPA enough to get into a big university with a social work program. It was in those junior college classes that I feel in love with teaching and writing. Why write about imperfection, and why now? I really started with an interest in studying the anatomy of connection. How do people cultivate genuine connection? About two months into that research I ran into this thing that unraveled connection; it tore relationships apart and fueled isolation. That thing was shame. I thought I’d merely “look into” the shame topic for a few months. Six years later, I finally got my head around shame and how it works. In your most recent post you said: ‘Being our best selves is about cultivating the courage to be vulnerable, authentic, and imperfect.’ How do you cultivate YOUR courage, Brené? As you know, courage is a huge theme in my life. It seems that I’m either praying for some, feeling grateful for having found a little bit, appreciating it in other people, or studying it. The root of the word courage is cor—the Latin word for heart. In one of its earliest forms, the word courage literally had a very different definition than it does today. Courage originally meant “To speak one’s mind by telling all one’s heart.” Over time, this definition has actually changed, and today, courage is synonymous with being heroic or performing brave deeds. Heroics and bravery are important, but I think we’ve lost touch with the idea that speaking honestly and openly about who we and about our experiences (good and bad) is the ultimate act of courage. Heroics is often about putting your life on the line. Courage is about putting your vulnerability on the line. In today’s world, that’s pretty extraordinary. 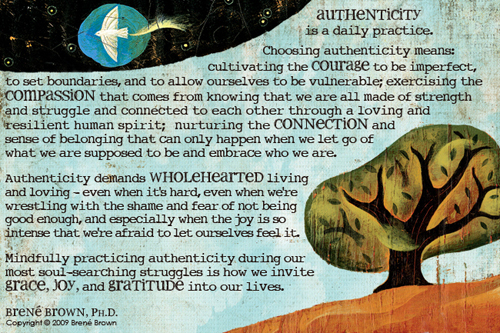 For me, practicing courage means telling my story with all of my heart. It means being honest about who I am, what I believe, and how I feel. It doesn’t come easy for me – I have a tendency to self-protect – but it really is about practicing authenticity and letting myself be seen. You’re a professor, a researcher, a writer, a mother, a wife. How do you dance with all these roles in a typical day? I have an amazing husband, a strong support network of friends and family, and two awesome kids. I try to set and hold a lot of boundaries. I love my online life and I’m grateful for the opportunity to share my work with the public, but I am an intensely private person and a homebody. I drive carpool, volunteer at the school store, sit in the front yard and talk to neighbors, do art with my kids, and sneak in as many date nights with Steve as possible. I schedule my downtime and family time just like I schedule my work events – they are nonnegotiable. I’m a deeply spiritual person, so my greatest personal inspiration comes from my faith. I access my faith mostly through nature, prayer, and music. Music plays a huge role in my life – I love everything, but mostly rock, 70s music, and Texas folk music. I’m on a Rolling Stones bender right now. I’m also inspired by people who share their gifts with the world – folks who are teaching and leading and holding space for others. I have a new “classes” tab on my blog. These teachers and their classes inspire me. Of course, there are several books that I would say literally changed my life. I want to learn more about this AND I want to live it. I’m working a couple of things right now. A book titled, The Gifts Of Imperfect Parenting, and a memoir titled, Wholehearted: Spiritual Adventures In Falling Apart, Growing Up, And Finding Joy. Dang! I’ve been trying to think of my list and I just can’t make myself do it. I could choose Martin Luther King and Eleanor Roosevelt, and other people I admire, but the truth is that I really don’t want to go to a dinner party. I’d like to cook something and sit down with Steve and the kids, then maybe piddle around the house while Ellen and Charlie play outside. What a lovely, inspiring conversation. Thanks so much for introducing us to Brene, and thanks to both of you for the generous giveaway. At the moment I’m reading Brené’s book on Shame and I absolutely love her work! I look forward to one time be able to read the book on the gift of imperfection as well! I was honoured to take part in Brene’s “I am enough” and thought this a wonderful thing to do. I love Brene’s philosophy and was so pleased to see her interview. Thank you Susannah! I work with women and men who have anorexia. They are experts on perfectionism! Brene’s new book ‘The Gifts of Imperfection” would be so helpful in my work and personal life. Thank-you Susannah for posting this interview and introducing Brené. This post has come along at just the right time for me. I’m off to check out her website. Brené’s new book is incredibly inspiring – thanks Susannah for recommending her work and thanks Brené for your wonderful writing! Looking forward to reading your book too! Yes, yes yes .. speechless but yes. I love the tenderness with which Brene shares herself and her story while she gives hope and strength to others with her words. I was there listening at her first webinar yesterday (Sydney time). I need to immerse myself in her words and this message. I’d love a copy of her book. Thank you so much for sharing this interview. I love everything she has to say, especially about having the courage to own our story. What a worthy goal to aspire to! I am so taken by these themes and by Brene. I would love to explore this further and delve into imperfection and living wholeheartedly. Great interview Susannah. I adore Brene’s work! You are both so inspiring. I’d love to get a copy of Dr. Brown’s new book! I am so in love with Brene’s Perfect Protest & cannot wait to share her new book for all my imperfectly wonderful girlfriends! I’d love to win this book; Brene has many good things to say. Thanks for the opportunity. Such a fantastic convo. I really enjoyed the authenticity illustration. I am so moved by this interview and I am eager to go read everything written by Brene. As a life-long perfectionist (and mother of one) everything she’s said resonates with me. I strive daily to live an honest and upfront life and to turn off the judgmental voice in my head. Boundaries! Oy!! My boundaries…I plan to read everything she’s written and pass it all on to my 16 year old son. He is such a precious person and I want him to get this message before he’s an adult! Thank you! I am scared shitless of being authentic in real life. I am so afraid of being seen and then being attacked/hurt. At the same time I long for nothing more then being who I am and being seen the way I truly deeply am and being loved and appreciated for it. I’m so used to being the freak, being different, misunderstood and lonely, it’s damn hard breaking out of my shell. And yes, I’d love to win a copy :) and I love that there are people like you (both Susannah and Brené and many more bloggers and people in the real world) who show me that it is possible, that it is sometimes hard and scary and that it is totally worth it. Very interesting interview Susannah! And I’d love to read the book! What a gift! I discovered Brené through various blogs of the wonderful people I met at Squam and absolutely loved your Glorious Imperfection post…I’m a rather lazy leg-shaver as well. I look forward to reading her books! Sounds like a book worth reading. I’ll definitely be looking into it. I think she is great, love her work. Her book sounds very interesting! Thanks for sharing her interview with us. I think i need to have this book no matter what but how nice it would be if it were gifted to me. I hope that book on imperfect parenting gets out in the world soon…what a relief it would be for us mommies/aunties/grandmas if we could shed this feeling that we need to do it perfectly. Everything said here so resonates. Thank you so much for this perfect conversation. I participated in Brene’s webinar the other eventing and it was one of the most valuable times I have spent on line in the past year. Her perspective is lucid and her communication is genuine and heartfelt. I am eager to own her books for myself and explore her ideas further. I have heard so much about this author; she has such interesting work. Great post! I have been reading her blog for the past year and I enjoy her! I am learning to embrace ALL of me since her “The Perfect Protest” campaign. I actually thought being perfect in other people’s eyes mattered. Well – WAKE UP CALL- it doesn’t! and I’m glad. Both Brene and Susannah have helped me really KNOW that we are all struggling and rejoicing with all of the same stuff. loved this interview. sounds like she wrote a book i NEED to read. and your imperfect post had me laughing – i LOVE your honesty. Really interesting blog, thank you both for sharing. I am a perfectionist and so nodded a fair bit, reading it. Would love to win a copy of Brené’s book. Love the messages share! I have her book on my wish list and would love a copy! To think I once thought that my perfectionism was a good thing as I worked hard to get everything just right. Now I see it differently and realise how much trying to be perfect has held me back. I would love a copy of this book. Last year — on this very site! — I won a copy of Brené’s video, The Hustle for Worthiness. Awesome good stuff. So I will disqualify myself from the drawing this time around. I just wanted to say thanks for bringing her back! Hrm…sounds like this book is something I should definitely read. Thank you for introducing me to such an inspiration! love this post! I’m perusing her site right now. I am 1/2 way through her latest book because I think you mentioned it here. She’s brilliant and I love people who tell on themselves! Thanks for bringing her to your readers. I’m going to check out her blog. Wow! Looks like I need to read this book. A friend keeps telling me to pick it up and here I am reading this interview and thinking she’s right! Thanks for the insight! This was a wonderful interview…I’ve been reading Brene’s work recently and it has been changing my life…thank yoU! Wow, what an inspiring and beautiful person! 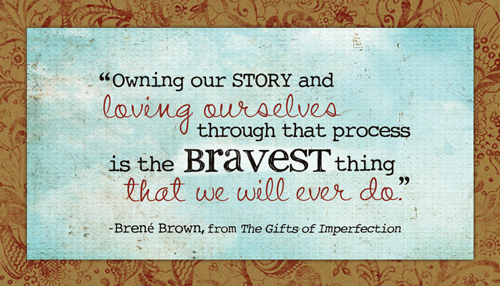 Thank you so much for introducing Brene Brown to me. I’m so looking forward to reading more of her work. Susannah, thanks for sharing more of Brene with us. I love her definition of courage…letting it soak in to my consciousness, knowing it will change the way I approach today. I’d love a copy of her book to read and pass on. Thank you both for this offer! Thank you for this inspiring topic! I know so many people (men and women) – including me – who want to do everything to 100 % or don’t do it. But this is a wrong attitude. Fabulous, hope to win the book. oh my – this was a truly inspiring post. I’m so glad my friend recommended it to me. If I can’t win a copy, I will definitely buy one. ;) I must check out her list of books. Wow – thanks for this interview! I especially love Brene’s dinner party answer. wow – that was really great. Thanks for sharing and thanks for the super giveaway! I am currently going through a HUGE shift, and with so much self-doubt ingrained, Brene’s words are a life-saving tool I’m using to beat the dear and make my dreams happen. Thank you so much for this snippet of her life, helping me remember that even the researchers aren’t perfect, so I really don’t need to be. ooh, pick me please! have been wanting to order this book and there’s no room in the budget at the moment. Thank you for the interview Susannah and Brené. Brené’s Perfect protest has changed my life, since then I’m really happy and I enjoy not to be perfect. I love Brené’s book and idea that she wrote this book. :-) She is a very inspirating person. This book should be published also in my country, in Hungary. A lot of people should read it and they could live a better and happier life! Would love to read her book!!! Thank you for sharing this powerful woman’s words here. I am especially in need of her message right now. I think perfection is highly overrated and very much enjoyed the interview. Thank you Susannah for introducing me to Brené. Have a beautiful day. Wow. What a great interview. Oddly life has a way of connecting us when we least expect it. My counselor just recommended I look into Brene’s work. Very inspiring. Something tells me that I should definitely read Brene’s books. I’ve spent most of my life as a perfectionist who is always concerned with what others expect of me and think about me. It’s exhausting. I would love to be able to embrace my imperfection! I am still trying to reconcile how amazing real and accessible this woman is, and that she works in an academic setting in a university. Is this proof that there are really are no fences? That authenticity transcends old tired paradigms and gives new life to what already exists?! Thank you for the hope and for the work that both of you are doing! Love her work – thank you for the introduction. This anti-perfectionism movement feels so important and really moves me. I need to read Brene’s book, it sounds like it would address a lot of the issues I am trying to deal with right now. It would be lovely to win it, but I will read it anyway. I was worried it would be academic in tone, but have taken a look on amazon and it seems like it is written in an easy to read, extremely thought provoking way. Great interview. I love her blog. What an inspiring Interview – thanks for the introduction. Will definitely go and visit her site too now. fantastic interview … I have found Brené’s work hugely inspiring and helpful as I work through my own struggles as a recovering Perfectionist and try to equipment my daughter with good shame resilience and healthy self esteem. It amazes me to see how ingrained some of these negative habits of comparing, judging and labeling ourselves seem to be. I would absolutely totally love to win a copy. of Brene’s book. This is a thing I need to work through here in my life. Gah! Thanks for the interview. A really good read. Perfectionism is a struggle for me all of the time!! I would dearly love to read this book but winning it would be even better. What’s not to love about winning a book!!! oh i so needed to read this today. i really truly did. thx for this wonderful interview susannah and sharing her amazing work!! I am looking forward to getting this book! This interview was great! Much love. Thanks so much for sharing the interview. I found Brene’s blog awhile back and have been wanting to read more of her work. Great stuff! Together, Women are an amazing transformational force. Love and honesty in all its shapes and forms is actually, surprislingly bareable when the shame is freed. thank you so much for the tools to look into my self, to explore me, and grow into loving me and expanding my world. I follow Brene on her website also and love her and her words! I look forward to reading your book and hers!